Tribal Belly Dance is an improvisational world movement style. It is a structured non-verbal language created in America, inspired by Middle Eastern dance with influences from around the world, including Indian, North African, Spanish, and Modern dances. There is no choreography. Dancers learn a vocabulary of steps, and they improvise unique dances using this vocabulary. They take turns leading and following each other. It is an elegant and earthy "in the moment" style, which celebrates connection and support among women. Tribal Belly Dance is a low impact form of exercise and expression, which is well suited to a woman's anatomy. It benefits women of all ages and body types. Beautiful movements blend organically into mesmerizing, meditative dances. As a performance dance, it is beautiful, powerful, and deeply moving. But there is never any pressure to perform in public. Tribal Belly Dance is first and foremost a social dance. We dance for ourselves and for each other. We dance to build community. We gain strength and flexibility, and we get a gentle aerobic workout. We let go of our stress. We enjoy the sensual stimulation of world music, flowing scarves and veils, beautiful costumes, rhythmic movement, and supportive companionship. We learn to appreciate and care for our bodies and our spirits. We nurture each other. We work hard, and we have fun! . For an interesting and thoughtful perspective on the evolution of tribal belly dance, please read About Tribal Belly Dance by Sharon Moore. 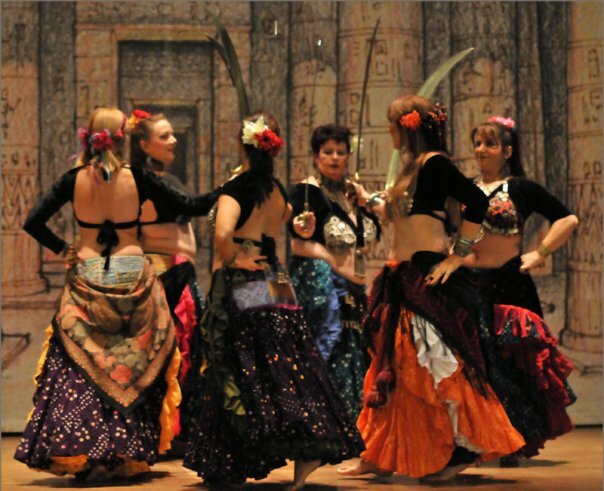 Tapestry Tribal performs group improvisational belly dance. Our vocabulary is blended, with Paulette Rees-Denis' Caravan Project as our primary lineage. We also incorporate moves from other tribal vocabularies, and we create our own.